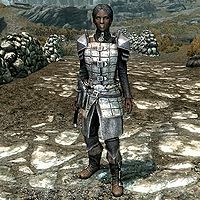 Saliah is a Redguard bandit who is randomly encountered after completing either The Bloodstone Chalice for the Volkihar vampires or A New Order for the Dawnguard. If you approach her, she'll say she has no time to talk as she is on urgent business for the Dawnguard, and she'll demand that you stand aside. She carries a key to Dawnguard caches and her orders from the Dawnguard. If you have sided with Harkon and the vampires, she will be hostile toward you. Below are maps showing the relative locations of the Dawnguard caches. Saliah is usually encountered near one of these locations, or en route between them. The Winterhold cache is described as being "under the great arch". This is a Nordic arch visible to the west as you head south on the road out of Winterhold, in a mountain pass just north of Azura's Shrine. If you reach the Whistling Mine, you've gone too far. This page was last modified on 23 July 2014, at 08:33.